The (brilliant) Scottish Job in pictures & words - What is happening in the world of Lonville? For the 7th Lonville Classic we swapped our beloved Swiss/Italian playground for the lochs, winding roads and mountains of The Scottish Highlands. The rally started at Colm House Hotel near Inverness, and took participants for 2.5 days across large parts of the highlands to drive beautiful roads, visit wonderful castles and country houses. 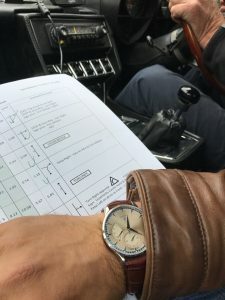 The tulip based roadbook consisted of various timed regularity stages, interrupted by wonderful lunches, painting test, clay pigeon shooting and possibly the best haggis we have ever tasted. Most importantly, the participants were brilliant. For half of the group this was their first Lonville Classic, while the other half were previous participants. Friends, husbands, wives, lovers, fathers, sons we had a brilliant mix of all ages and multiple nationalities. All this added to a unique atmosphere. Below a few impressions, and all the way below an outline of the routes. Leaving the Coul House hotel the route will take you along the edge of the Beauly Firth and through the small city of Inverness, the most northerly city in the UK and regarded as the capital of the Highlands. Soon after leaving the city you will pass along the edge of the Culloden Battlefield, site of the last battle to take place on British soil in 1746, when the Jacobite uprising came to a brutal climax. Passing Culloden Wood the route continues to Cawdor Castle for coffee. Dating back to the late 14th century, the castle was built to replace a nearby fortress established in the late12th century and remains the home of the Cawdor family to this day. Although famously linked by William Shakespeare to Macbeth, the High King of the Scots, the present castle was built after Macbeth’s time. However, the area was certainly associated with the life and activities of Macbeth and his family. From Cawdor the route takes you through wooded and open areas to the village of Dava before crossing open moorland to pass along the edge of Lochindorb. Located on a manmade island in the Loch are the ruins of Lochindorb Castle, former stronghold of the Clan Comyn. The route now takes you south and west towards Dulnain Bridge and on to Grantown on Spey, the heart of Speyside. Almost half of Scotland’s distilleries are located in the area around Grantown. Continuing towards the lunch stop at Ballindalloch Castle, the route will take you close to the river Spey, one of the finest rivers for salmon fishing in Scotland. Built in the early 16th century, Ballindalloch Castle has remained in the ownership of a single family, the Macpherson-Grants. Known as the “Pearl of the North”,the castle is one of the finest examples of its kind and continues to be the family home. From Ballindalloch the route takes you south to Glenlivet Distillery, home of the The Glenlivet. Whilst many distilleries existed in the area, in 1824 Glenlivet was the first in the parish to obtain a licence and is the only distillery that can legally call its whisky “The Glenlivet”. After a visit to the distillery the route will take you along part of the “whisky trail” and through Charlestown of Aberlour, before heading northwest. Passing through the small town of Forres, the route runs close to the coast before joining the trunk road to cross the Moray Firth on the suspension bridge overlooking Inverness and on to the end of day one at the Coul House Hotel. Starting from the Coul House hotel, the route takes you south through Muir of Ord and on towards Drumnadrochit located near to Urquhart Bay and where you will get your first view of Loch Ness. Urquhart Castle set on a rocky outcrop overlooking the bay is one of the most popular visitor attractions is Scotland as the uninterrupted views over the Loch make it a popular location for those searching for “Nessie”, the Loch Ness monster. The route continues along the western side of Loch Ness towards Fort Augustus and offers several locations to stop and view the Loch. Morning coffee is located at Fort Augustus Abbey (no longer home to a religious order), part of which incorporates the remains of the original fort from which this small town bears its name. Located at the southernmost point of Loch Ness, the town is bisected by the Caledonian Canal over which the route passes. Continuing south west, the route runs along the Great Glen and along the eastern edge of Loch Lochy before turning south to head towards Spean Bridge. A brief stop at the Commando Memorial will give you an opportunity to see Ben Nevis fromthe viewing point (clouds permitting) before continuing on the short route to lunch at the Inverlochy Castle Hotel. The original Commando training camp was established six miles north of the monument at Achnacarry Castle and volunteers would march past this point after arriving at Spean Bridge railway station. After lunch there is a short drive to Ben Nevis distillery before continuing through Fort William and along the eastern edge of Loch Linnhe. At North Ballachulish the route turns west to run briefly along the edge of Loch Leven before the spectacular climb up Glen Coe and over Rannoch Moor before continuing along Glen Dochart towards the picturesque village of Killin for coffee. After coffee, the route continues along the northern side of Loch Tay, through Tay Forest Park and on to Aberfeldy. The road bridge in the town is known as General Wade’s Bridge and is part of the network of military roads in Scotland established by General Wade following the Jacobite uprising in 1715. The bridge is still used to this day. From Aberfeldy the route runs south west to Dunkeld and on to the overnight stop at the Hotel. Starting from our Hotel, the final day of the event will take you west towards Crieff and the opportunity for a brief stop at Glenturret, Scotland’s oldest distillery and home of The Famous Grouse Whisky. Moving on from Glenturret the route continues west along the northern edge of Loch Earn before turning south at the appropriately named village of Lochearnhead. A detour west along the edge of Loch Voil passing the church where Rob Roy is buried takes you on to coffee. Following coffee and retracing the road back towards Balquhidder, the route will turn south to run along the eastern side of Loch Lubnaig before turning west to pass Loch Venacher, through Brig o’Turk and Loch Achray in the heart of the Trossachs. Turning south, the route takes you through Queen Elizabeth Forest Park and along the famous Duke’s Pass before continuing on to Lunch on the banks of Loch Lomond, the largest single inland waterway in the UK. The rally finishes with Lunch and the prize ceremony at Cameron House Hotel.